The iPhone will launch today at 6:00PM all over the USA. The service for the phone will be exculsivly provided by AT\&T. The phone is marking the next big product from Apple after the much successful iPod. Hundreds of gadget fans have already lined up to get there hands on this new phone which mixes the regular phone with capabilities like playing music and video, Web browsing, and many more. It is priced at $499 (4GB model) and $599 (8GB), which does not include the phone plan to be provided by AT\&T from $60 to $100 a month. Maria Sharapova and Sania Mirza move onto round two at the Wimbledon Open currently being played in England. Second seed Maria Sharapova defeated Chan Yung-Jan of Taiwan 6-1 7-5. 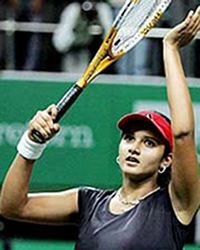 Sania Mirza defeated Yaroslava Shvedova 6-0, 6-3. The 26 years old Paris Hilton was released from Los Angeles County jail early Tuesday morning after a three-week stay. She is still on probation which ends March 2009, and must keep her her driver's license current and and stay out of trouble. She was initially arrested after she failed a sobriety test and later she was stopped driving with a suspended license. Indian Idol 3 brought back 6 contestants that were previosly voted off to give them yet another chance. They included Aisha Sayedr, Ankita Mishra, Amit Paul, Bhavin Dhanak, Shantanu Sudame, Suhit Gosain and Padmanav Bordoloi. From these Amit Paul was choosen by the public to rejoin the 11 in the gala round and then Ankita was choosen by the 4 judeges to be the 13 member in the gale round over Suhit and Padmanav, who again were sent home. 06/25/2007: Roger Federer beat Teimuraz Gabashvili of Russia 6-3, 6-2, 6-4 in his opening match at Wimbledon. Roger Federer will be playing to win his fifth consecutive Wimbledon. Andy Roddick started by beating Justin Gimelstob 6-1, 7-5, 7-6 (3). Former Wimbledon champion Martina Hingis beat Naomi Cavaday 6-7 (1), 7-5, 6-0. Sania Mirza today will being her quest at the Wimbledon Championship against Yuri Shvedova of Russia. If Sania wins her first round match she will then face another Russian, 11th Seeded Nadia Petrova. Apple's iPhone to be launched on Friday, June 29 at 6:00 pm Eastern time (2200 GMT). The new device from Apple promises to bring together mobile phone, camera, web browser, music and video player in a single pocket-sized personal unit. AT\&T is the sole telecoms carrier authorized to provide service for the iPhone. The iPhone will sell for $499 or $599 depending on the model. Voted off June 05, 2007. Voted off June 08, 2007. But rejoined on June 22. Voted off June 09, 2007. Rejoined on June 23. Voted off June 04, 2007. Voted off June 08, 2007. Voted off June 07, 2007. She was part of Indial Idol 2, when she got the chicken poks and had to leave the show. Voted off June 09, 2007. Indian Idol has finally begun, they have narrowed the final list of contents to 28 vs the usual 24, to include 14 males and 14 female singers. The show is a big hit and is hosted by Mini Mathur and Hussain Khuwajirwala and the judge include Annu Malik, Alisha Chinoy, Udit Narayan and Javad Akhtar. This year Indian Idol search for talent outside India by visiting London and Dubai. Season 3 of the Indian Idol will bring on 2 new judges to replace Sonu Nigam and Farah Khan. The new judge, Alisha Chinoy and Udit Narayan, will join Anu Malik for season 3 of Indian Idol. Auditions dates: Jodhpur \& Bhubaneshwar (Feb 15th), Hyderabad \& Amritsar (Feb 18th), Srinagar \& Nagpur (Feb 21st), Baroda (Feb 27th \& 28th), Bhopal (March 7th \& 8th), Kanpur (March 12th \& 13th), Delhi (March 17th, 18th \& 19th), Kolkata (March 24th, 25th \& 26th), and Mumbai (March 31st , 1st \& 2nd April). Both Sonu Nigam and director-choreographer Farah Khan will not be returning as celebrity judge from Indian Idol 3 .